There are journeys that instill in us a sense of wonder and magic, stories that take us through worlds of imagination and sensual evocation. Whether it’s Atreyu or Bastian making their way through Phantasia, Alice exploring the Wonderland, Helena traversing the Cities of Light and Shadow, Ink trying to reach the headquarters of the Incubi, or Sarah finding her way through the Labyrinth of the Goblin King, their journey is always the heart of their story. Meridian will enable you and two or more of your friends to create your own such accounts. It gives you an ever-shifting map and a magical carriage, but you make each journey unique. 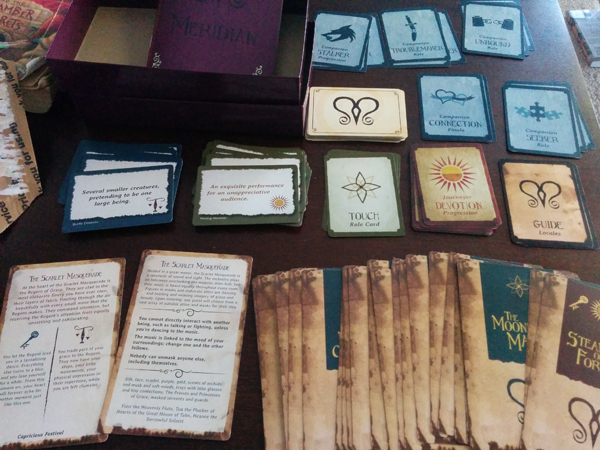 Meridian recently successfully funded on Kickstarter. The game is now available via The Game Crafter! If you already have the game, here's the FAQ and Advanced Techniques document mentioned in the rulebook. We've also created a short video showing how to set up and play the game. Finally, if you have Tabletop Simulator (available on Steam), you can play a virtual demo game by subscribing to it from the workshop.